Anyone living in new Congressional District 33 or new State House District 101 who thinks they can wait until November to cast a meaningful vote is flat out wrong. Both districts are overwhelmingly Democratic. The only election that matters is the Democratic primary. 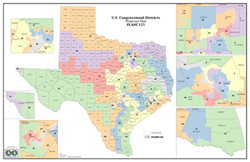 New Congressional District 33 spreads across both Tarrant and Dallas counties, including large parts of Fort Worth and the City of Dallas. Many observers expected the Dallas Morning News to endorse one of the Dallas-based candidates. The congressional redistricting proposal announced earlier today continues Texas Republicans’ dishonest attack on voters. In a live radio interview last week, top Texas GOP operative and Rick Perry insider,Ted Delisi, removed any doubt that Perry, Greg Abbott and the Texas Republican leadership see the Texas redistricting litigation before the US Supreme Court as a chance to end the US Voting Rights Act. The new 2010 Census data confirms what the Lone Star Project and many others predicted – the dramatic population growth in Texas over the last ten years is driven almost entirely by minorities. Nearly 9 out to 10 of the new residents in Texas are non-Anglo.